Enjoy keeping your LEGO® bricks organized with this smart and robust LEGO Classic Creative Suitcase. 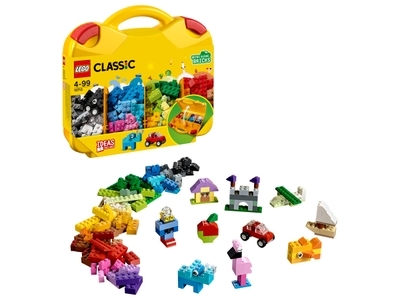 Open the yellow case to access the brightly colored bricks, and then have fun creating cute creatures, cool cars, cozy houses and whatever else you can imagine. When you're done, place your bricks into their compartments, just the way you like, and you're ready to go! Price is 30% below the initial Lego retail price, a € 6.00 discount! This comes down to 6.57 cent per brick. The Creative Suitcase (10713) Lego set is available from the sites below. However, they do not offer delivery to your selected region. The Creative Suitcase (10713) Lego set is no longer directly available from the sites below. However, 3rd party partners of these sites might still have the set available. Alternate description Bring along a world of creativity in your own LEGO® Creative Suitcase! Features a sturdy yellow suitcase with handy sorting compartments and a selection of colorful pieces, including, bricks, shapes, wheels and eyes. Suitcase measures over 10” (26cm) high, 11” (28cm) wide and 2” (6cm) deep. Visit LEGO.com/classic for additional building instructions, fun videos, ideas and inspiration. Ask your parents before going online. This building bricks set is suitable for ages 4-99.